, a puritan divine of great learning and eminence, was born in Hertfordshire, about the year 1535. Having been kept at a grammar-school till he was fit for the university, he was sent to Cambridge, where he was admitted into St. John’s college in 155O. 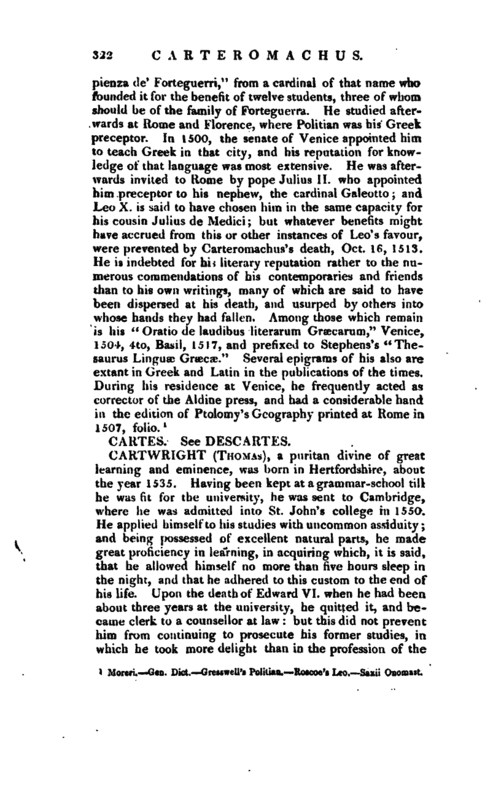 He applied himself to his studies with uncommon assiduity; and being possessed of excellent natural parts, he made great proficiency in learning, in acquiring which, it is said, that he allowed himself no more than five hours sleep in the night, and that he adhered to this custom to the end of his life. Upon the death of Edward VI, when he had been about three years at the university, he quitted it, and became clerk to a counsellor at law: but this did not prevent him from continuing to prosecute his former studies, in which he took more delight than in the profession of the | law. He remained in this situation till the beginning of the reign of queen Elizabeth; when the gentleman under whom he was placed as a clerk, having met with Dr. Pilkington, master of St. John college, Cambridge, he made him acquainted with his strong attachment to literature. 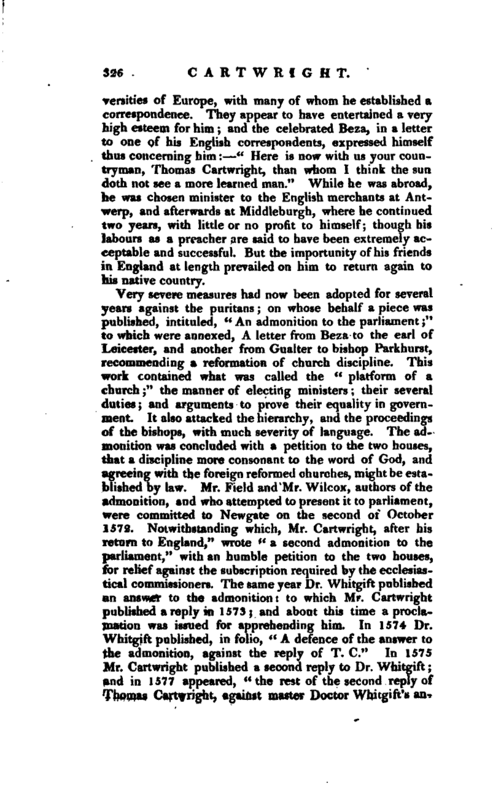 In consequence of this the doctor desired to have some conversation with Mr. Cartwright; when, being convinced of his great abilities and attainments, he offered to take him back again to St. John’s, to which his master consented. He accordingly returned to the university; and in 1560 was chosen fellow of that college. 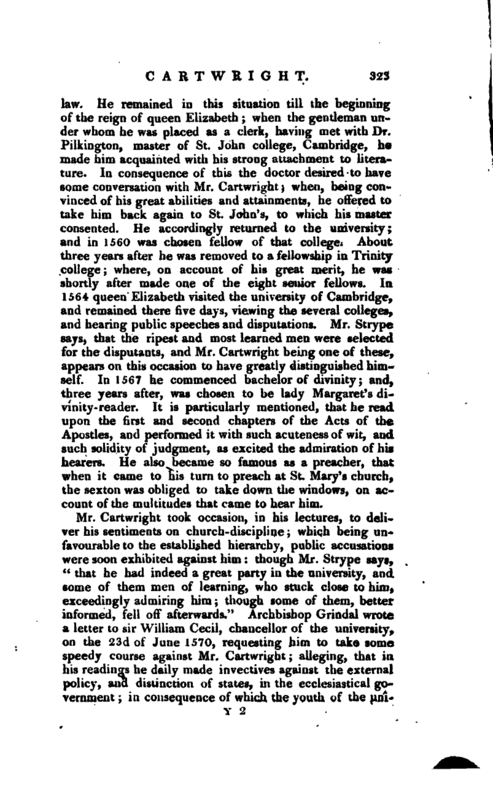 About three years after he was removed to a fellowship in Trinity college; where, on account of his great merit, he was shortly after made one of the eight senior fellows. In 1564 queen Elizabeth visited the university of Cambridge, and remained there five days, viewing the several colleges, and hearing public speeches and disputations. Mr. Strype says, that the ripest and most learned men were selected for the disputants, and Mr. Cartwright being one of these, appears on this occasion to have greatly distinguished himself. In 1567 he commenced bachelor of divinity; and, three years after, was chosen to be lady Margaret’s divinity-reader. It is particularly mentioned, that he read upon the first and second chapters of the Acts of the Apostles, and performed it with such acuteness of wit, and such solidity of judgment, as excited the admiration of his hearers. He also became so famous as a preacher, that when it came to his turn to preach at St. Mary’s church, the sexton was obliged to take down the windows, on account of the multitudes that came to bear him. 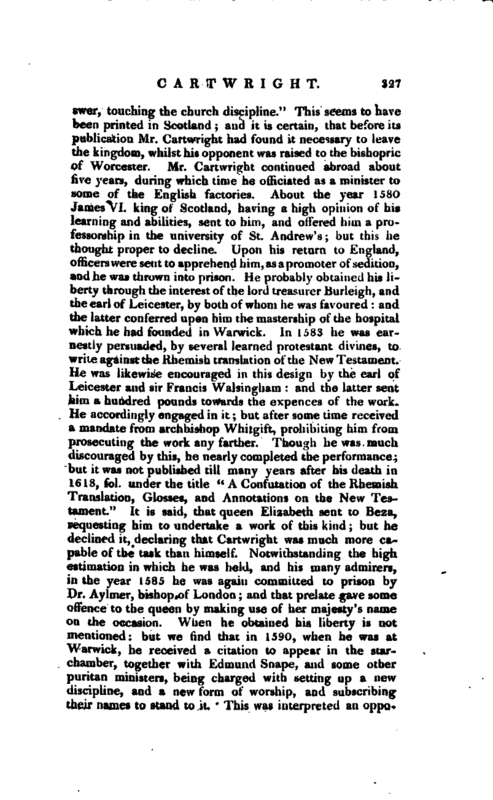 Mr. Cartwright vindicated his conduct in a letter to sir William Cecil, dated the 9th of July; in which he declared his extreme aversion to every thing that was seditious and contentious, and affirmed that he had taught nothing but what naturally flowed from the text concerning which he had treated. He observed, that when an occasion offered itself of speaking concerning the habits, he had waved it: though he acknowledged that he had taught, that the ministry of the church of England had declined from the ministry of the ancient and apostolical church, and that he wished it to be restored to greater purity. But these sentiments, he said, he had delivered calmly and sedately, and in such a manner as could give offence to none but the ignorant or the malignant, and those who were eager to catch at something to calumniate him. He asserted, that he had the utmost reason to believe that he should have obtained the testimony of the university in favour of his innocence, had not the vicechancellor denied him a congregation. He solicited the protection of the chancellor, so far as his cause was just; and transmitted to him a testimonial of his innocence, signed by several learned members of the university, and in which his abilities, learning, and integrity, were spoken of in very high terms. 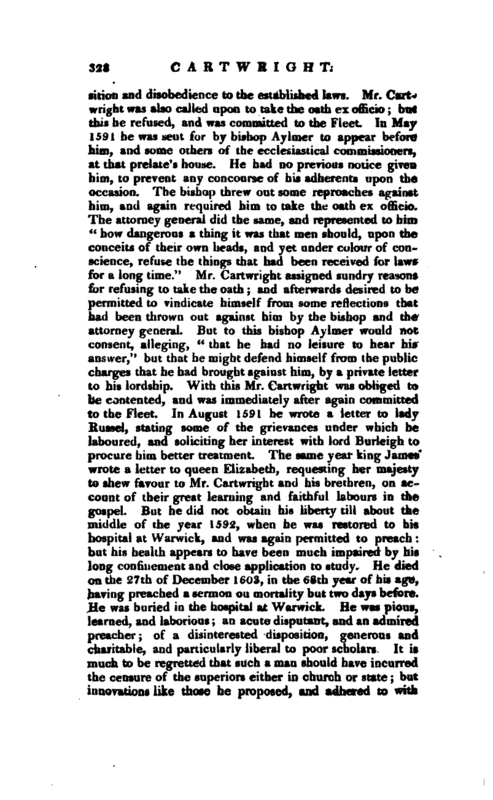 After this he was cited to appear before Dr. Mey, the vice-chancellor of the university, and some of the heads of houses, and examined upon sundry articles of doctrine said to be delivered by him in his public | lectures, and which were affirmed to be contrary to the religion received and allowed by public authority in the realm of England; and it was demanded of him, whether he would stand to those opinions and doctrines, or whether Le wuuid renounce them. Mr. Cartwright desired that he might be permitted to commit to writing what his judgment was upon the points in controversy; which being assented to, he drew up six propositions to the following purport, and which he subscribed with his own hand: “I. The names and functions of archbishops and archdeacons ought to be abolished. II. The offices of the lawful ministers of the church, viz. bishops and deacons, ought to be reduced to the apostolical institution: bishops to preach the word of God and pray, and deacons to be employed in taking care of the poor. III. The government of the church ought not to be entrusted to bishops chancellors, or the officials of archdeacons; but every church should be governed by its own minister and presbyters. IV. Ministers ought not to be at large, but every one should have the charge of a certain flock. V. No man should solicit, or stand as a candidate for the Ministry. VI. 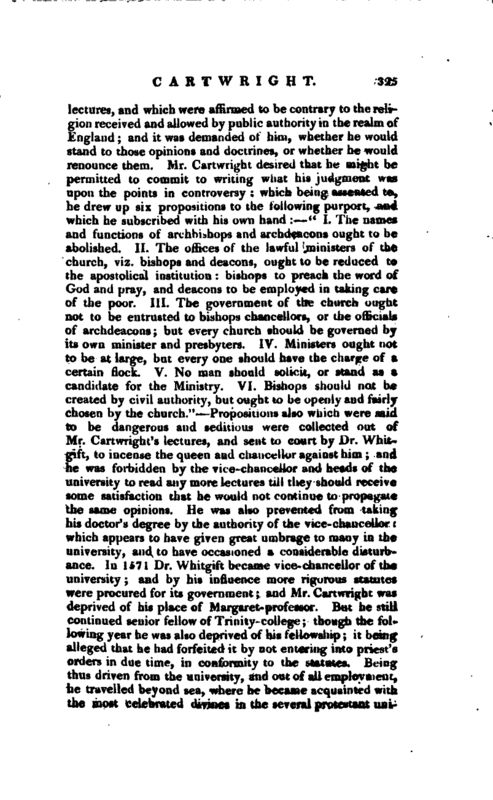 Bishops should not be created by civil authority, but ought to be openly and fairly chosen by the church.” Propositions also which were said to be dangerous and seditious were collected out of Mr. Cartwright’s lectures, and sent to court by Dr. Whitgift, to incense the queen and chancellor against him; and he was forbidden by the vice-chancellor and heads of the university to read any more lectures till they should receive some satisfaction that he would not continue to propagate the same opinions. 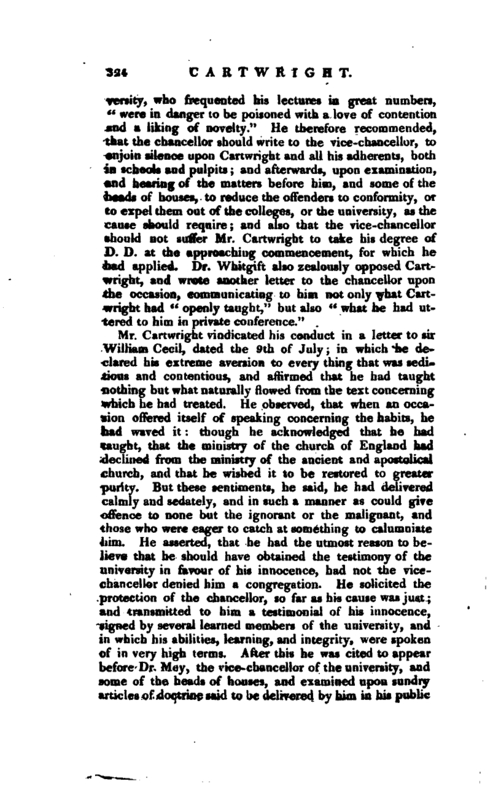 He was also prevented from taking his doctor’s degree by the authority of the vice-chancellor: which appears to have given great umbrage to many in the university, and to have occasioned a considerable disturbance. In 1571 Dr. Whitgift became vice-chancellor of the university; and by his influence more rigorous statutes were procured for its government; and Mr. Cartwright was deprived of his place of Margaret- professor. 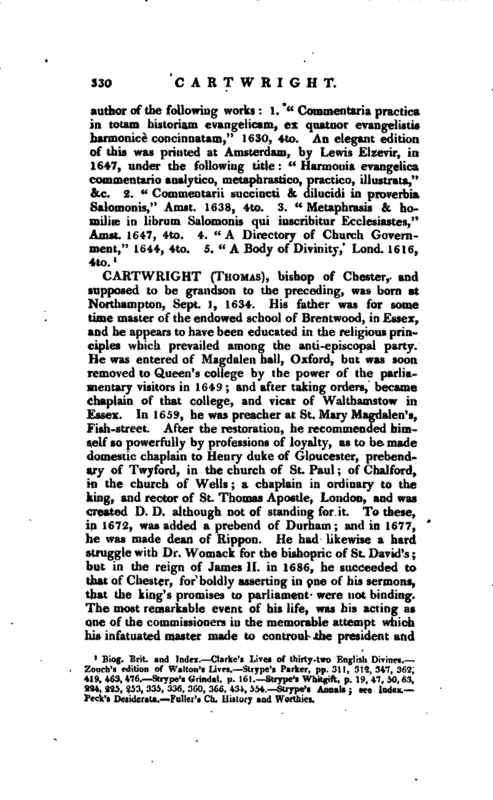 But he still continued senior tellow of Trinity-college; though the fol* lowing year he was also deprived of his fellowship; it being alleged that he had forfeited it by not entering into priest’s orders in due time, in conformity to the statutes. Being thus driven from the university, and out of all employment, he travelled beyond sea, where he became acquainted with the most celebrated divines in the several protestant | universities of Europe, with many of whom he established a correspondence. 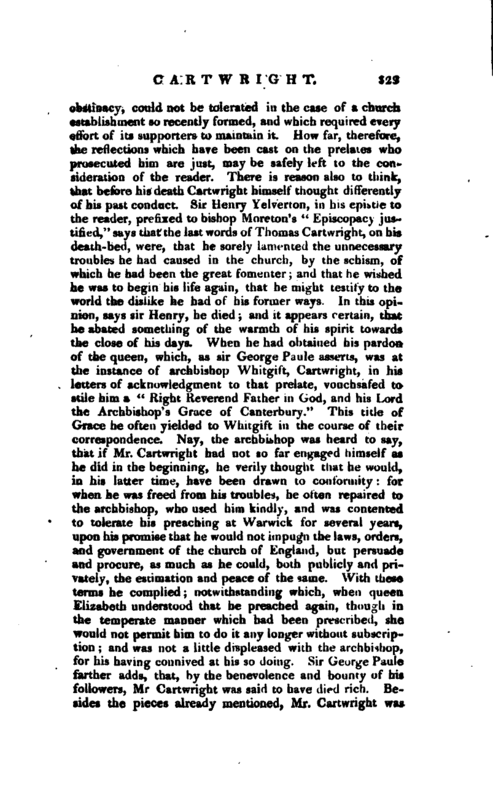 They appear to have entertained a very high esteem for him; and the celebrated Beza, in a letter to one of his English correspondents, expressed himself thus concerning him: “Here is now with us your countryman, Thomas Cartwright, than whom I think the sun doth not see a more learned man.” While he was abroad, he was chosen minister to the English merchants at Antwerp, and afterwards at Middleburgh, where he continued two years, with little or no profit to himself; though his labours as a preacher are said to have been extremely acceptable and successful. But the importunity of his friends in England at length prevailed on him to return again to his native country. Biog. Brit, and Index. Clarke’s Lives of thirty-two English Divines. Zouch’s edition of Walton’s Lives. —Strype’s Parker, pp.311, 312,347. 419, 463, 476. —Strype’s Grimlal, p. 161. —Strype’s Whit^ft, p. 19, 47, 50, 63. 2*4, 225, 253, 335, 336, 360, 366, 434, 354 -- —Strype’s Annals see Index. Peck’s Desiderata. Fuller’s Ch. History and Worthies.